The article that follows is an excerpt from H.W Crocker III’s The Yanks Are Coming! A Military History of the United States during the First World War. It is now available for order from Amazon. All four sons of former president Theodore Roosevelt served in the Great War. One, the youngest son, Quentin (1897-1918), was killed in it; two others, Theodore Jr. (1887-1944) and Archie (1894-1979), were badly wounded. They had been raised to be men of action as well as intellect. They certainly passed that test. There were six children all told. Roosevelt’s two daughters were Alice, who became a famous Washington hostess and wit, and Ethel, who was actually the first Roosevelt in a war zone in World War One, serving as a nurse in France (her husband was a surgeon). Theodore Jr., the eldest son, from a young age aspired to be his father, and their careers had modest parallels, with junior serving, as his father had done, in the New York State Assembly and (after the Great War) as undersecretary of the Navy. Though all the boys were vigorous outdoorsman, none was more so than second son Kermit, who, though sickly as a child, became his father’s aide-de-camp for adventure, accompanying him, as a Harvard undergraduate, on a yearlong safari to Africa and then a few years later on a near-fatal journey into the Amazonian jungle. Literary-minded and facile with foreign languages, Kermit was, unlike his brothers, moody and subdued; his father sometimes worried about Kermit’s depressive spirits. Quentin was the golden boy—the hilarious juvenile terror of the White House, funny, fearless, academically gifted, mechanically brilliant, and personally charming. All the Roosevelt boys learned to shoot from a relatively early age, and they became better shots than their big-game-hunting father, who once had to confess, when asked whether he was a good shot, “No, but I shoot often.” Ted was given his first rifle at age nine. 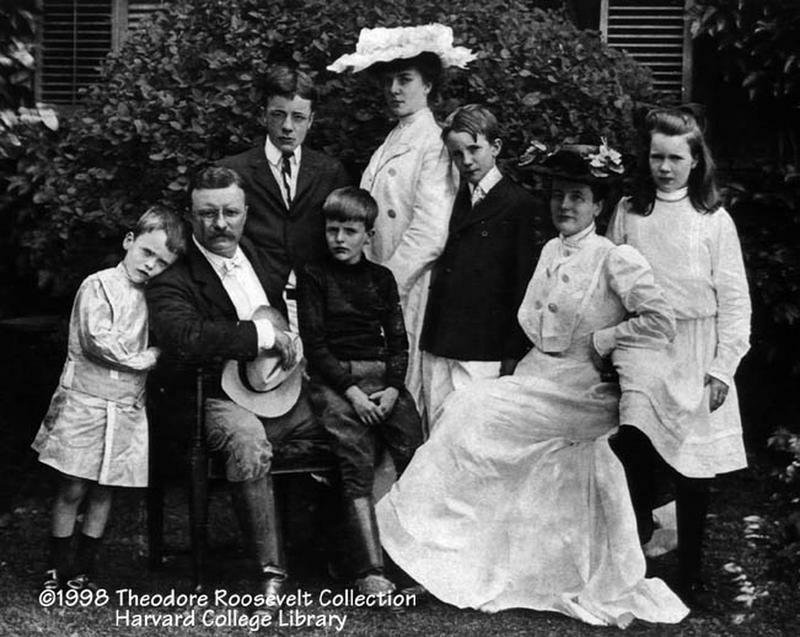 To prove to his son that it was a real rifle, Roosevelt shot a small, neat hole in the ceiling and pledged young Theodore not to tell his mother. That was the sort of house Roosevelt kept. He had designed Sagamore Hill, the family home, for a large family before he had one, intending it to be a specially memorable place for the children, with its extensive grounds giving them “every benefit of the freedom of wild places.” Once they were old enough to go hunting on their own—or actually with old friends—he helped them plan their trips out West. As for their formal education, the boys attended public schools for their early years before they were sent to boarding school (Groton, from which Archie was expelled), and then the Ivy League (Harvard). Along with their rustic hunting trips, this gave the boys a proper admixture of democratic experience and aristocratic demands. Among those aristocratic demands was military service in time of war. Ted had actually sought a military career, but Roosevelt had denied him permission to go to West Point or the Naval Academy, wanting him to go to Harvard. Roosevelt, for all his own martial nature, thought of military service as an aspect of a man’s life, not a career, for there were too few opportunities for exceptional, individual achievement in a peacetime military, and too much invitation to mediocrity, waiting around for seniority and promotion. With the U.S. declaration of war in April 1917, not only did Roosevelt himself try to return to the colors (only to be denied by order of President Wilson), but every one of his sons took a commission. All had taken prewar officer training as part of the Plattsburgh Movement for military preparedness, though Kermit, who had been working at a bank in Buenos Aires, had the least. Theodore Jr.—a successful businessman, married, with three children (a fourth would come in 1919)—was commissioned a major, and Archie, who married shortly after the declaration of war, was commissioned a first lieutenant. They were on the first troop transport to France. Kermit, thinking that it would take too long for American troops to go into action, used his father’s assistance to be commissioned in the British army, and did so, typically, not out of a sense of martial ardor, but of somber duty, confessing to his father that the “only way I would have been really enthusiastic about going would have been with you”—as if the war were another safari across Africa or trek into the South American jungle. Kermit did, however, have a dramatic role in view: he wanted to fight in the Near East and see the fall of Constantinople from the Turks to the British. To that end he became a captain in the British army and was sent to Mesopotamia. He brought his wife and son (three more children would be born in due course) across the Atlantic with him, despite the danger of U-boats, and housed his family in Spain, where his wife’s father was ambassador. Quentin, meanwhile, dropped out of Harvard, became engaged to the granddaughter of Cornelius Vanderbilt, eluded the restrictions of an Army physical examination (by memorizing the eye chart and lying about a serious chronic back injury), and, after his Flying Corps training, was commissioned a first lieutenant. To their father’s disapproval, Ted and Archie arranged to serve together in the 26th Infantry Regiment of the 1st Division. 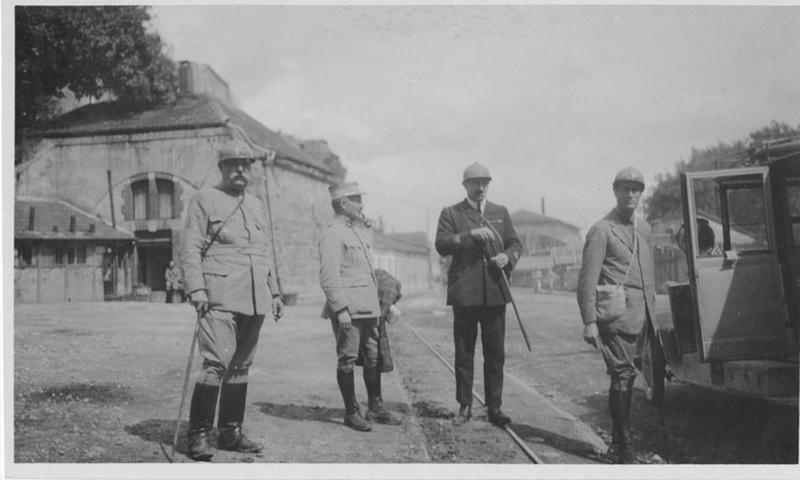 Ted, despite his amateur standing in the eyes of the professional officers with whom he served, proved himself an excellent trainer of troops, applying Roosevelt family–style competition (pitting units against each other) and exacting discipline and standards of physical fitness (endless push-ups and pull-ups, especially as punishments), along with practicality and an obvious concern for the well-being of the men. Aristocrats they might be, with a deep sense of noblesse oblige, but Ted and Archie quickly dispelled suspicions that they were spoiled rich man’s sons. Their toughness, enthusiasm to pitch in, and generosity (including buying farmers’ produce for the troops when government rations weren’t up to snuff) won them admiration and respect. Kermit and Quentin were not long behind Ted and Archie, with Quentin being among the first American air officers to arrive in France, in August 1917. Like his brothers, he proved himself an extremely capable officer with a manner that inspired confidence and affection. Eddie Rickenbacker remembered him as “Gay, hearty, and absolutely square in everything he said or did. . . . was one of the most popular fellows in the group. . . . He was reckless to such a degree that his commanding officers had to caution him repeatedly about the senselessness of his lack of caution. His bravery was so notorious that we all knew he would either achieve some great spectacular success or be killed in the attempt. . . . But Quentin would merely laugh away all serious advice.” Quentin was more than a dashing flyboy; he was also a gifted administrator—which might not have been suspected in someone so apparently lighthearted and highspirited—and could ably turn a wrench with the oil-spattered mechanics. He charmed the locals, too, with his fluent French. Kermit was less interested in charming Iraqi Arabs, but he quickly made himself fluent in Arabic and commanded an armored car (built by Rolls Royce). He adopted a British swagger stick as part of his kit and used it, rather than a revolver, to demand the surrender of Turkish soldiers he confronted after busting down a door during the battle for Baghdad. They complied, and Kermit won a British Military Cross for his courage, just as Archie won a French Croix de Guerre (and two Silver Stars), and Ted was later awarded the Croix de Guerre and Chevalier de la Légion d’Honneur (and the American Distinguished Service Cross). With American troops moving into the battle line, Kermit sought and received a transfer to the American Army, where he was commissioned a captain of artillery. Roosevelt knew his boys were brave, but he also cautioned them against taking unnecessary risks, saying on more than one occasion that if, after the boys saw action, their superiors deemed them more useful as staff officers than combat officers, they should not decline the posting “merely because it is less dangerous.” Nevertheless, they lived the dangerous life. Archie had an arm broken and a kneecap shattered by shrapnel; Ted was gassed and shot in the left leg and never regained feeling in his left heel. Quentin, though not in action, had already broken an arm and reinjured his back crash-landing a plane and had been hospitalized for pneumonia. On 6 July 1918 he had his first dogfight and came back elated. In combat against three German planes, he had shot one down and evaded the other two. His proud father wrote, “Whatever now befalls Quentin, he has had his crowded hour, and his day of honor and triumph.” That pride, however, was admixed with anxiety. Quentin considered himself an extremely well-trained pilot who could survive any aerial challenge. If any Roosevelt son should die, however, he openly mused that he should be the one because he had no children—though of course he wanted to live, marry his fiancée, and have a family of his own. On 14 July, Quentin was shot down. At first he was listed as missing, but on 20 July came confirmation that he had been killed. Quentin’s Croix de Guerre was awarded posthumously. Roosevelt himself, though touted by some as the likely Republican nominee for president in 1920, was a physical wreck. He had never recovered from his arduous and disease-ridden 1913–1914 expedition into the Brazilian jungle, and in November 1918 his numerous ailments led to an extended hospitalization. At Sagamore Hill for Christmas and the New Year, he was no longer the unstoppable dynamo, but a tired old man barely able to walk. He had lived long enough to see Archie come home, Ted promoted to lieutenant colonel (in September 1918), and victory in the war; he died on 6 January 1919. It was for a while, at least, before an enemy grenade exploded into the same knee that had been hit with shrapnel in France. He served in New Guinea from 1943 to 1944 and was invalided out of the service, the only American soldier to be declared 100 percent disabled in two wars. He returned to his brokerage business and dabbled in right-wing causes. In 1971 his wife died in a car crash, in which he was driving, and he secluded himself in Florida, where he died in 1979.